The Raven-CAT is a departure from all my earlier designs. Firstly, this is a 3-way. It uses the Morel CAT 378 for the treble, a Dayton RS180P for midrange and a Dayton DA270 10″ aluminum cone woofer for bass. Apart from the Raven-CAT being a 3-way, it is also a minimalist. In other words, all 1st order networks. The satellite is a 2-way, 13 liters bass reflex that houses the CAT 378 tweeter and RS180P midwoofer. For convenience, this housing is separated from the bass enclosure of the DA270. I recommend placing it on top of the bass box for critical listening. For general use, they can be on stands with the bass boxes situated somewhere else, like in satellites and subwoofers setup. Fig 1 – Morel CAT 378 Frequency Response. Mic on axis, Impulse Window 5ms, No smoothing. The Black plot in Fig 1 is the RAW response of the CAT 378, surface mounted onto a 13 liters box with a baffle of 8.5″. The Red plot is with a 1st Order filter, just a capacitor in series. However, it is more than that. To get the response I’m after, I had to add a high frequency compensating network to flatten the top. Finally, a conjugate network (LCR) is necessary to suppress the resonant peak. Fig 2 – Dayton RS180P-8 Frequency Response. Mic on CAT 378 axis. Impulse Window 5ms, No smoothing. 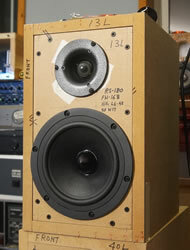 I would have liked to use my Dayton RS180s-8 but I felt the cone breakup is a bit much for 1st order. So, I acquired the RS180P-8, which on paper, has a less intimidating cone breakup. I was disappointed to find that the cone breakup is still there, only not as sharp and loud as the RS180s. The Black plot in Fig 2 is the RAW response of the RS180P-8. The Blue plot is with an inductor in series. As with the CAT 378, it needed more than this. I had to install a Zobel network and additional filter in parallel to the inductor to force the cone breakup down further. Otherwise, the offending peaks will pierce right through the tweeter’s response. Fig 3 – RS180P-8 with LP filter and CAT 378 with HP filter. Fig 4 – Summed Response of RS180P and CAT 378. Fig 3 shows the acoustic crossover of the RS180P and the CAT 378. Their summed response is in Fig 4. Impulse Window is 5ms. Mic on axis with the Morel Cat 378. No smoothing applied for these two plots. The overall response (Fig 4) is quite remarkable. It is virtually flat from 500Hz~118kHz, except for a -6dB notch at about 2.8kHz. This dip is the effect of Baffle Edge Diffraction of the CAT 378. Flush mounting and sloping the the edges of the front baffle will mitigate this anomaly. Fig 5 is the Waterfall plot of the Raven-CAT (courtesy of REW). Before I proceed further, I should point out that this is a highly magnified view (note the Time Range of 1.0ms). The CSD shows a very clean treble from 5kHz~20kHz. Fig 6 – Raven-Cat satellite TES. Impulse Window = 5ms. Mic on Cat 378 axis. Fig 6 is another view of the behavior of the Raven-CAT. We can see that most of the excess energy are at 2kHz (the light blue slices). This correspond with the Waterfall in Fig 5. Fig 7 is yet another view of the Raven-CAT. It is clear from this Wavelet that there’s a tiny bit of time smearing at 2kHz. This confirms the Waterfall in Fig 5 and the Toneburst in Fig 6. Fig 8 is the Harmonic Distortion of the Raven-CAT satellite. It is encouraging to see 2nd and 3rd harmonics from 500Hz upwards are about -60dB below the fundamental. What is interesting is there are no signs of added distortion at 2kHz. We can therefore conclude that the cone breakup of the RS180P does not generate distortion. Measurements below 500Hz should be disregarded as my room is interfering with the sweep. Now that the Raven-CAT satellite is established, I turned my attention to the bass. After testing the 10″ Dayton DA270 in a Reflex and Sealed loading, I eventually opted for a 55 liters Sealed Box. It goes down to 45Hz (-3dB), which is fine for music. And being a sealed box, the bass sounds more natural because the roll off is not as steep as a reflex. Below is how the system looks like. In this version, I substituted the 55 liters Sealed Boxes with two compact Dayton 8″ Bandpass Subs. The bass is tighter, clearer and with improved dynamics. I recommend this version for Hi-Fi. The Dayton DA270, on the other hand, is better suited for Home Theater. Fig 9 – Frequency Response of Dayton SD215A-88 Bandpass Subwoofer. Mic at mouth of port. She is right at home with Bela Fleck and the Flecktones. In their track The West County (UFO Tofu album), the Raven-CAT delivered the bass with precision and texture. More than that, her midrange kept up with the speed of Bela Fleck’s banjo. The Raven-CAT is no slouch with voices too. I don’t think I’ve ever been so moved by Elvis singing Are You Lonesome Tonight and Crying in the Chapel. In Donna Summer’s In Another Place and Time, it’s hard not to notice the prominent bass that holds the song throughout. The Raven-CAT is cheap for this level of performance.